You are in a rush and late for an appointment. You swing into the gas station and begin to fuel your vehicle up. When you are done you whip out the nozzle only to find that the gasoline was not finished going into the tank. The result is you and your clothing being soaked in gasoline. While all you have to do is take a shower to get rid of the gasoline smell, how do you get it out of your clothing? 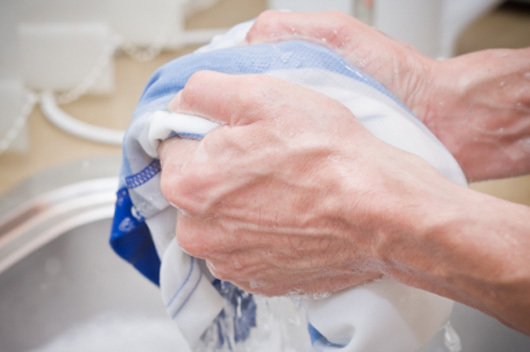 • Pre-soak: First take the cloths off and completely soak them in warm water and then ring them dry as best you can. • Sunshine: Lay the cloths that are soaked with gasoline out to dry in the sun. This will completely dry the cloths and the sun and fresh air will help to start the smell of the gasoline to dissipate. • Soak clothing: Next mix warm water with some vinegar and swash the clothing around in it. Make sure you agitate the material of the clothing well so that the vinegar can penetrate the gasoline and do its job. Let the cloths sit in the solution for about 20 minutes. Take them out of the solution and put them back in the sun to dry. • Soak again: Mix another solution of warm water and this time use Dawn liquid detergent. In addition to putting the Dawn in the water, put it directly on the spots where the gasoline soaked the garment and rub it in. Then swash the cloths in the solution and let it sit for an additional 20 minutes. Take the clothing out of the solution and once again put them in the sun to dry. • Use baby oil: Since gasoline is an oil based product, it will need the help of an oil based product to get it out of your cloths. Put your gasoline stained cloths in the washer and use regular detergent and top it off with a small amount of baby oil. Be sure you are only washing the gas laden cloths and nothing else. • Sunshine again: You guessed it, more sunshine. Because the baby oil will be in the clothing now, you will want to set the cloths back out into the sun and let them dry. If you put an oil based product in the dryer you could be risking a fire. You will have to wash the cloths several more times before the baby oil is completely gone. • Repeat: For tougher gasoline stains, you may have to repeat this process a couple of times. While it is a lengthy process it does in fact work. At the very least it is worth a shot before you just throw away cloths that are perfectly fine and can be saved.